At last! A thriller-diller that thrills. A whodunnit that puzzles. And it’s true, too. After over seventeen years in China, Paul French can fairly be called an old China hand. 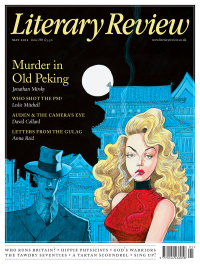 Although he lives in Shanghai, he knows Peking – now Beijing – and its sometimes dark history, and has a style worthy of Raymond Chandler: he uses ‘muscle’ for bodyguards in just the right way. And in his extensive research French, almost by luck – but luck favours the keen – uncovered a real-life septuagenarian sleuth who out-Holmesed Holmes.